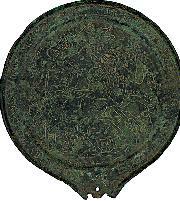 Etruscan mirrors were generally cast in bronze,which is an alloy of copper and tin. 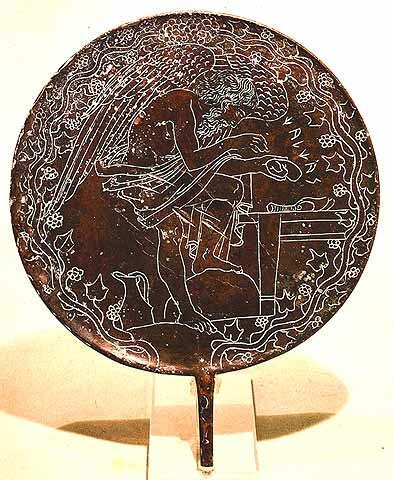 Etruscan bronzes also occasionally contained a smaller proportion of lead, but no zinc. 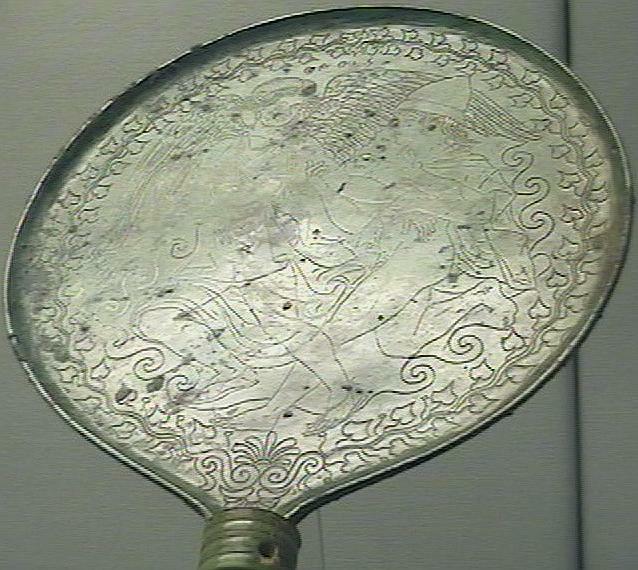 The tin was originally traded with the Gauls, who probably obtained it from the British Isles (Cornwall), but in later years, tin was discovered at Campiglia, near Populonia. 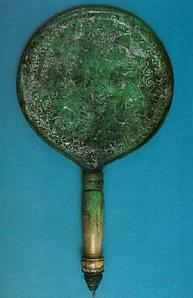 Etruscan mirrors were generally cast in one piece, with a blunt spike known as a tang. This tang was then inserted into a handle made from some other material such as wood, timber, bone or ivory. 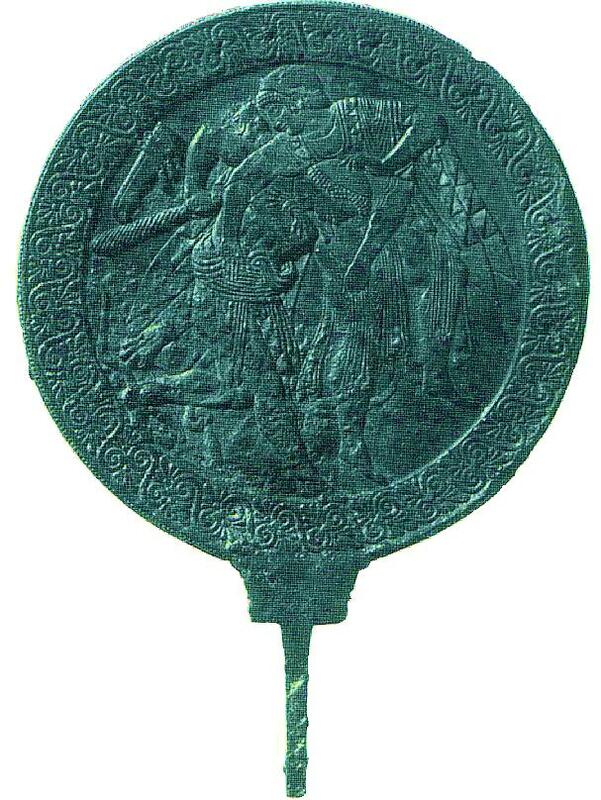 However in some examples, the mirror was cast entirely in bronze and included an integral bronze handle. 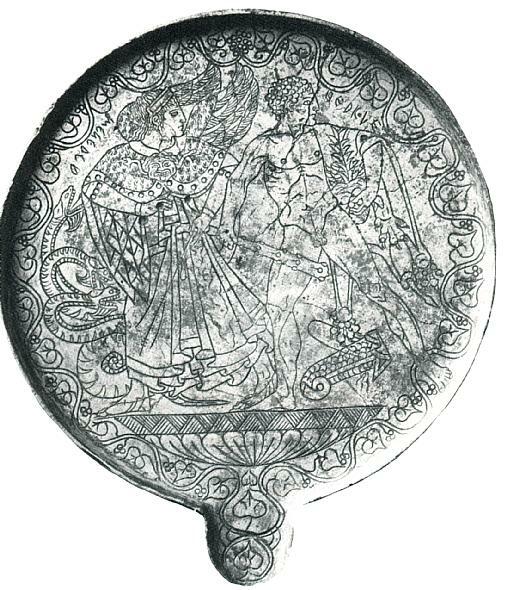 The reverse of many Etruscan mirrors have a picture engraved or moulded in low relief. The front of the mirror was highly polished using such materials as ground pumice or cuttle fish bone. Later mirrors were made with bronze containing a higher proportion of tin. 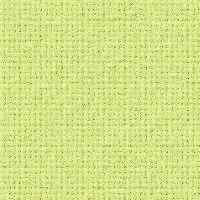 This resulted in a more resilient surface which was brighter in colour and therefore gave a better reflected image. 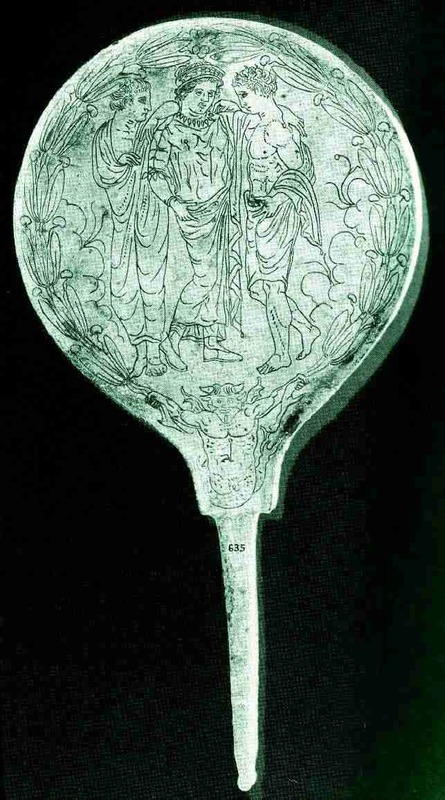 The image on the reverse of Etruscan mirrors generally showed pictures of Women, often (but not always) in a mythological context. In many cases, Greek mythology is depicted, but often with an Etruscan theme, or altered from the original Greek myth in some way. 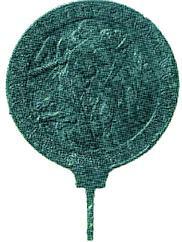 Examples of such scenes include the birth of Athena (Menerva) from the head of Zeus (Tinia), the labours of Heracles, including some unknown Etruscan variants, and the Dioscuri, usually accompanied by a female figue, (Leda/ Latona ?). Mirrors deposited in tombs were often deliberated destroyed by scratching "suthina" (pertaining to the Tomb) on the polished surface. Often text on mirrors was written from right to left, or in both directions, depending on the overall aesthetic effect desired. 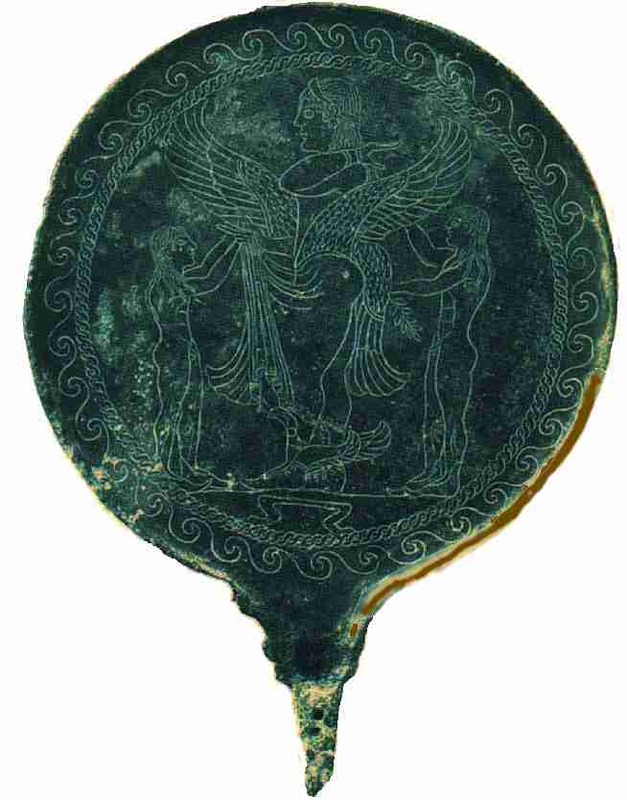 It is interesting to note that unlike contemporary Greek mirrors, many Etruscan mirrors although designed for women, had numerous inscriptions on them, which supports the other evidence about the high literacy levels (and social standing) of Etruscan women.